Opencart Advanced Registration: Opencart Advanced Registration module can be used to create registration fields for the customers. If you want to extend the customer registration form then this module is the best choice for you. Using this module you can extend the registration form by creating fields. Admin can create different types of fields like select, radio button, text, file, etc. Opencart Advanced Registration - Opencart Advanced Registration module can be used to create registration fields for the customers. If you want to extend the customer registration form then this module is the best choice for you. Using this module you can extend the registration form by creating fields. Admin can create different types of fields like select, radio button, text, file, etc. Note:Webkul is proud to announce our cloud-based helpdesk system "UVdesk". UVdesk is super handy to use with tons of features like ticket generation via email, knowledge-base, online form builder, automatic actions or workflow, reports, customizations and much more. Easy to extend the registration form. No limit of creating fields. Admin can get more information about customers. Fields can be created with different input types. Admin can disable the fields without deleting. Admin can disable few of the default registration fields. Admin can select customer group for each field. Admin can add validation for custom fields. Admin can create different types of registration fields like select, radio, text, etc. Admin can enter the name of the field and select the customer group for which the field is applicable. Also, admin can set if the field is required or not and enter the field value in case the field is radio, checkbox, select type. Admin can create multiple types of fields. Admin can set field as required. Admin can enable disable the field. Admin can select for which customer group field is applicable. Admin can create fields for account or address section. If admin wants to remove any field from the registration page then admin can simply disable it instead of deleting the field. 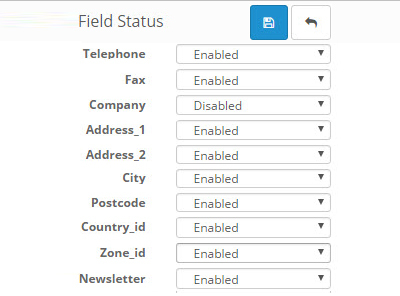 Admin has a field status menu under which all the fields are available and admin can set their status. Admin can also set the status of many fields which are provided by Opencart by default. 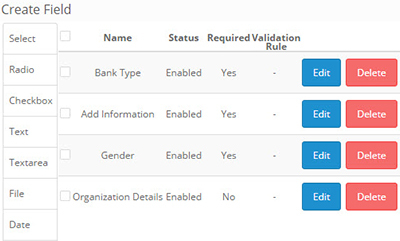 Admin can set the enable or disable the status fields. Admin can set status of default Opencart fields. 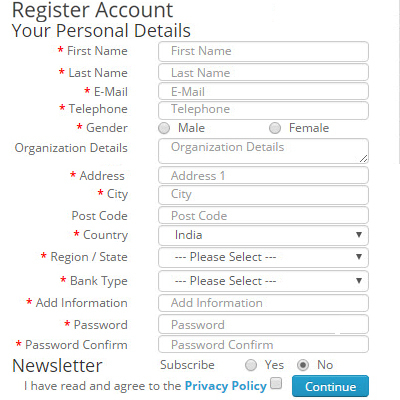 A customer can see the registration fields on the registration page of Opencart. First customer need to select the customer group according to which fields are populated. After registration customers can edit the field value. Customers can go to account section to edit the account fields and for address fields they need to edit their address. Customer can see the fields according to their user group. Customer can see and edit the account fields under their account section. Customer can see and edit the address fields under their address. Did you buy Opencart Advanced Registration?